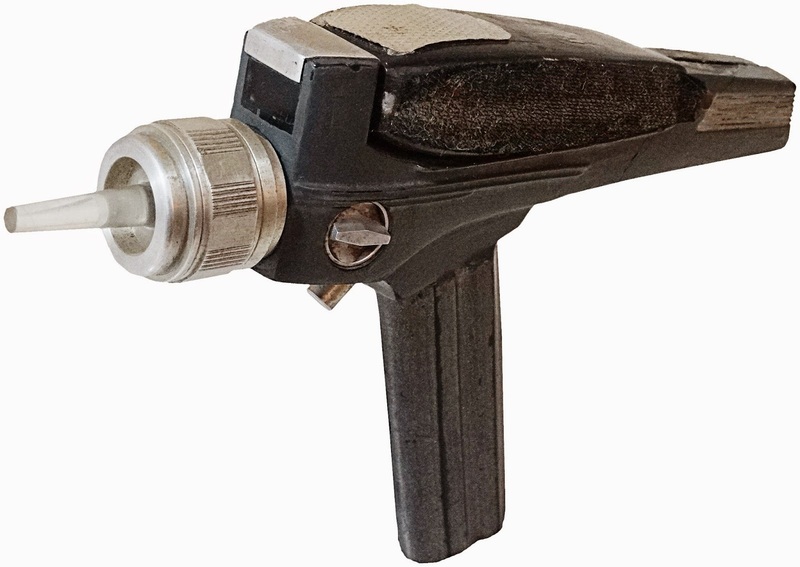 This exceptionally rare Star Trek: The Original Series fiberglass mid-grade Phaser Pistol is one of only two such examples known to have survived from the '60s; and it has been exhaustively researched and precisely screen matched to the mid-grade phaser prop featured in an opening scene in the 2nd season TOS episode "Assignment: Earth", where it is seen in a close-up view on-screen in the hand of a security officer in the Transporter Room. 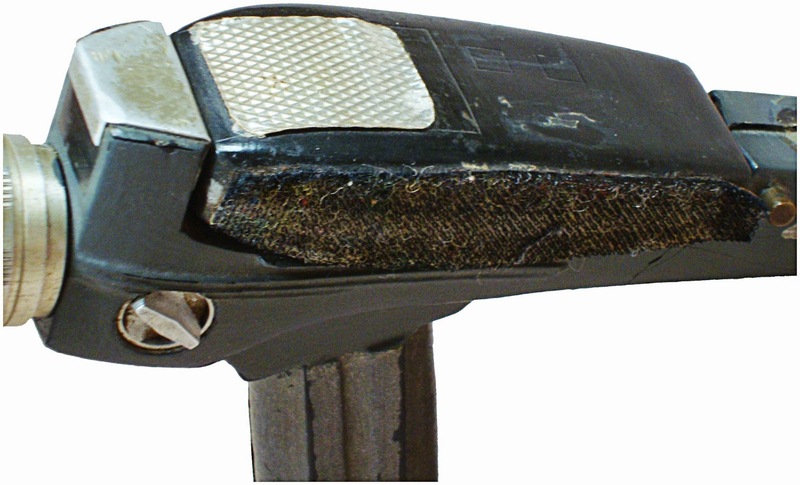 Most significantly, it is the presence of both a uniquely contoured scratch line and a small blemish formed by excess paint - both on the front face of the pistol body - as well as perfectly matching orientations of the attached silver nozzle ring and the right-angled metal plate on top that have enabled this particular prop to be positively identified on-screen in that memorable time-travel episode, which originally was broadcast on Mar. 29, 1968. Furthermore, it is very likely that this historic hand prop, as part of the Desilu and then Paramount inventory, was utilized in the filming of several other TOS episodes during the 2nd and 3rd seasons of the series, in addition to "Assignment: Earth". In the following five composite images containing Original Series screen captures shown side-by-side with modern day photos of this fiberglass Phaser Pistol, please note the matching overall contours and matching designs of the major hand phaser and pistol body components that are seen from multiple camera angles -- in addition to the numerous very subtle contour matches specifically mentioned in the annotations. 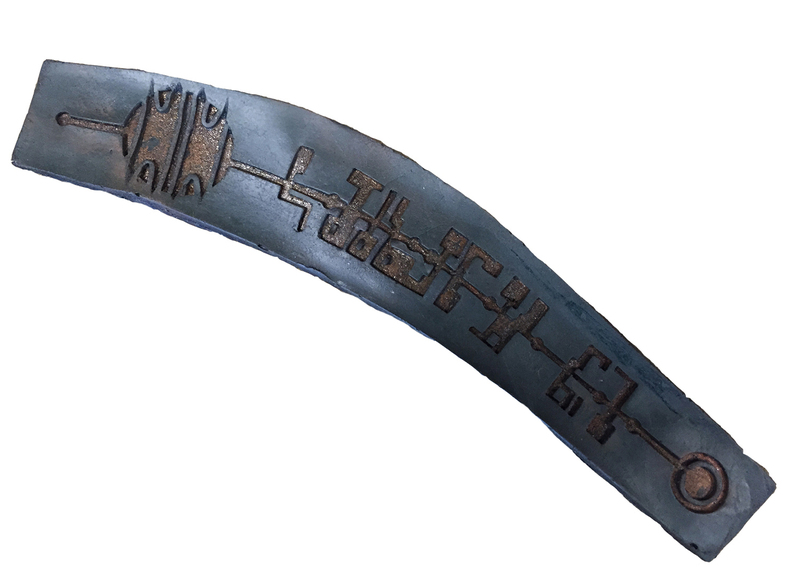 The following image demonstrates the precise screen match of this unique prop to the episode "Assignment: Earth". 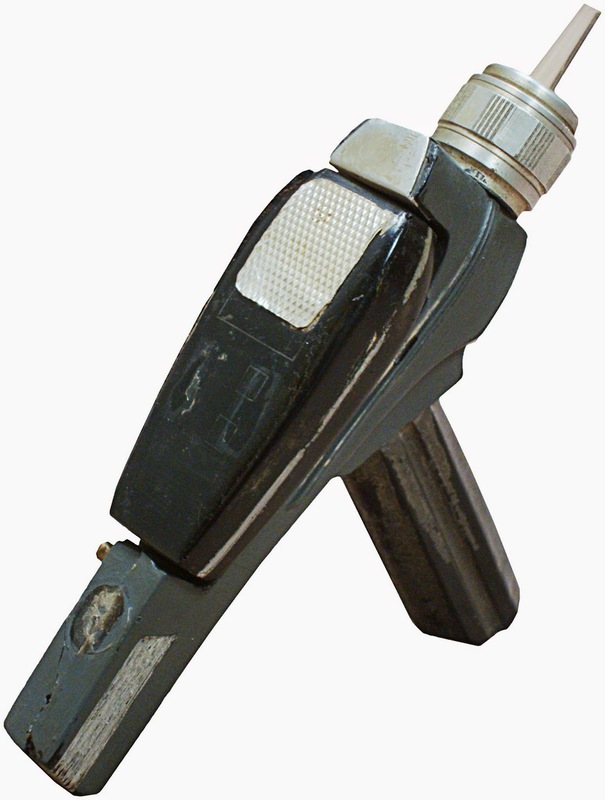 A key aspect in the authentication of this phaser was the identification of a tiny mold flaw / accent line defect in its rear body fin appearance which is a perfect match to a mold flaw observed on a different phaser seen in a close-up screen capture from the Original Series episode "Spock's Brain". 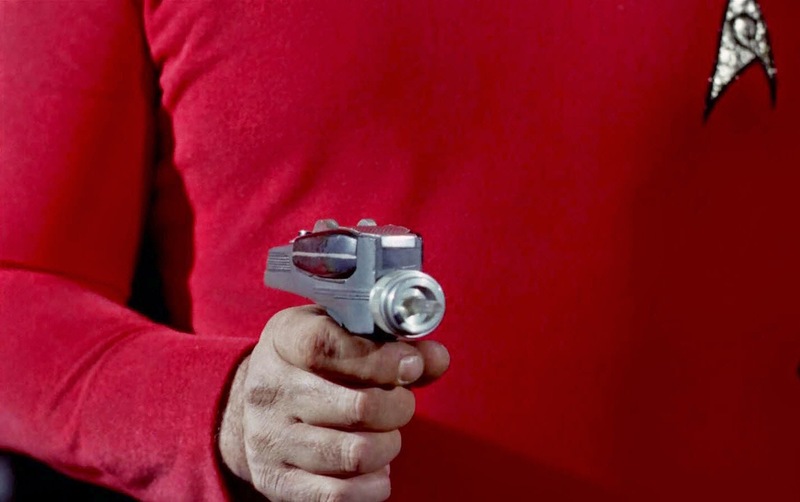 In the following image, note how the width of the highlighted white band on the phasers suddenly narrows at the end due to the little flaw / deviation of the grey ridge line that runs along its bottom border. The different orientations of the grooved regions on the silver noozles attached to the front of the pistol bodies establishes that the two phasers seen below are in fact two different hand props and not the same piece. 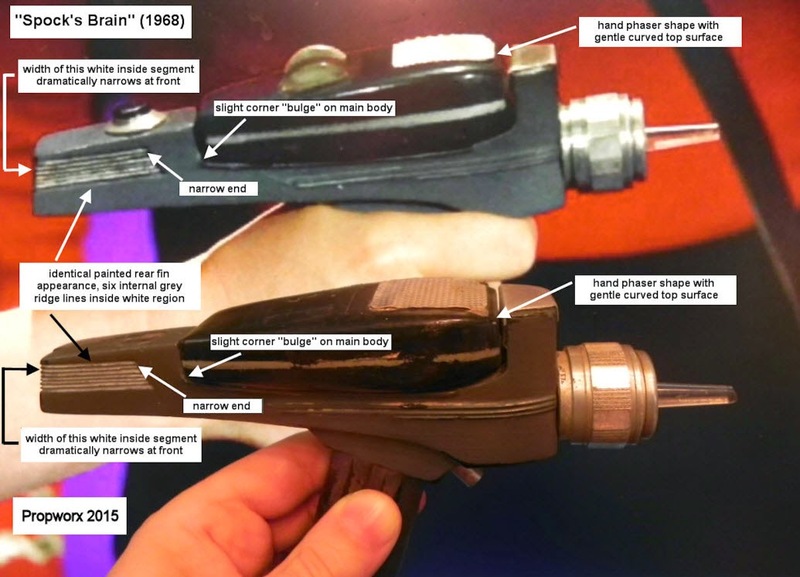 The presence of several very subtle contour line matches and tiny geometry matches between this unique phaser and the examples observed on-screen in different Original Series episodes, as illustrated in the photos below, are additional highly compelling factors in the authentication analyses. 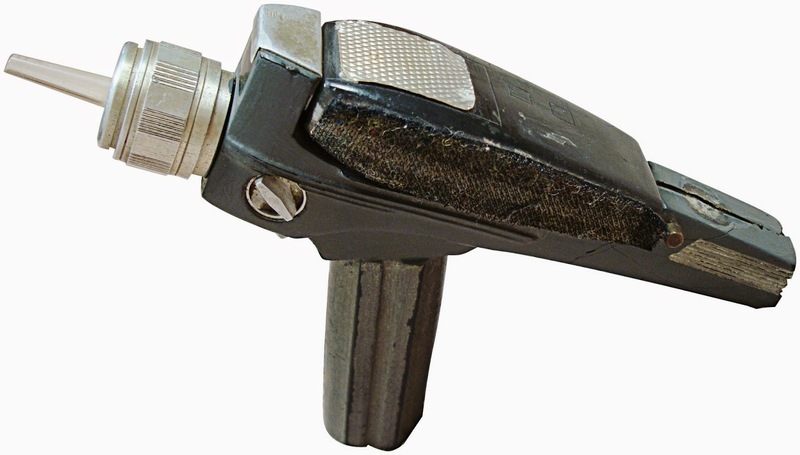 As well, the uniquely patterned silver foil material on top of the permanently affixed hand phaser unit has been photo matched to the foil on the Greg Jein TOS Hero Type II Phaser, and this vintage material match is another key element of authentication. 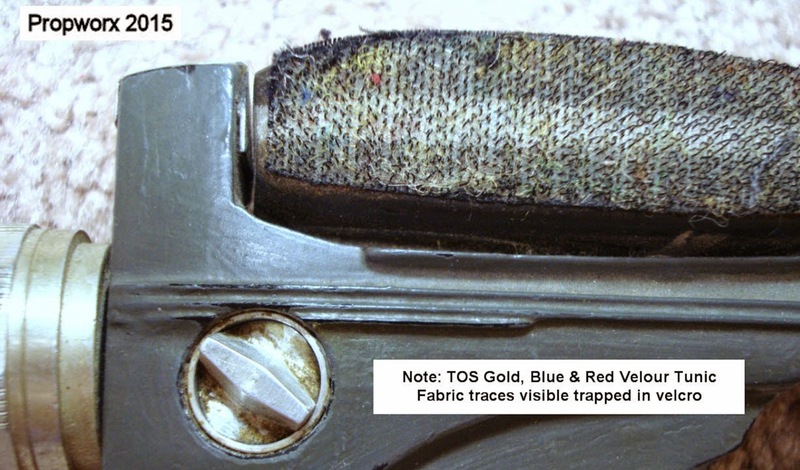 Additionally, high resolution photography of the velcro on the hand phaser has revealed some gold, blue and red TOS velour Starfleet tunic fabric traces still trapped in the velcro - exciting remnants from production on the Desilu soundstage 47 years ago! 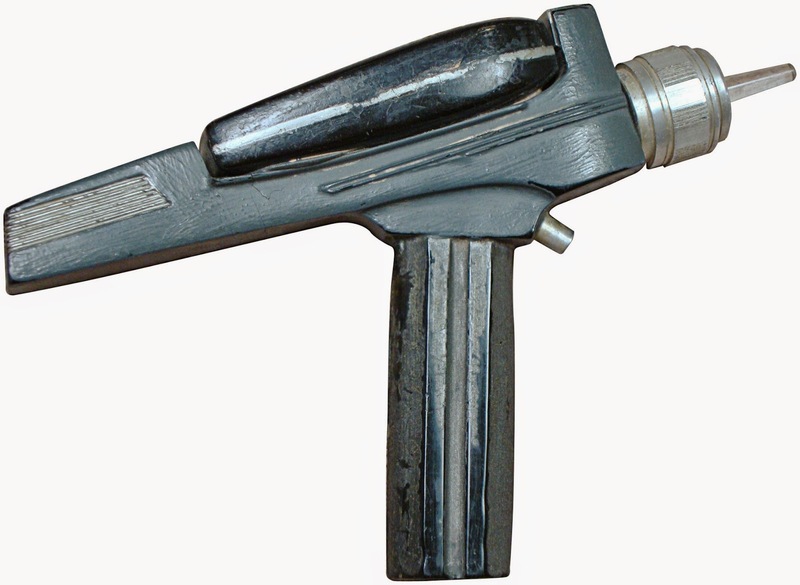 This extremely rare Original Series hand prop bears the to-be-anticipated paint wear, surface scratches and some cracks/seam separation in its fiberglass pistol body; and it is missing the semi-circular acrylic dial and metal faux thumbwheel control that were once attached to the top of its hand phaser -- yet it remains an undeniably visually exciting, sturdily-constructed and highly presentable piece of Star Trek history. 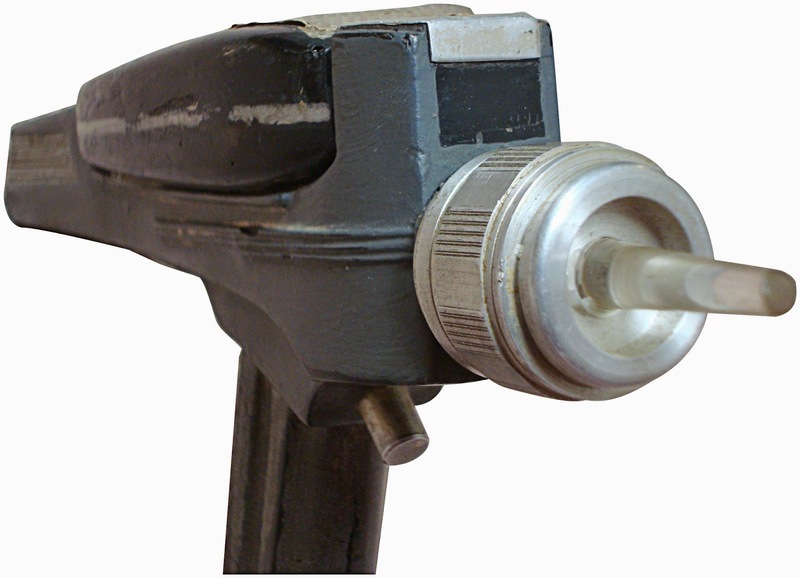 The only movable part on this weapon is the tiny circular silver control knob inset on the front left side of the pistol body which still smoothly rotates a full 360 degrees. Thanks to Gerald Gurian, the owner, for writing this blog! 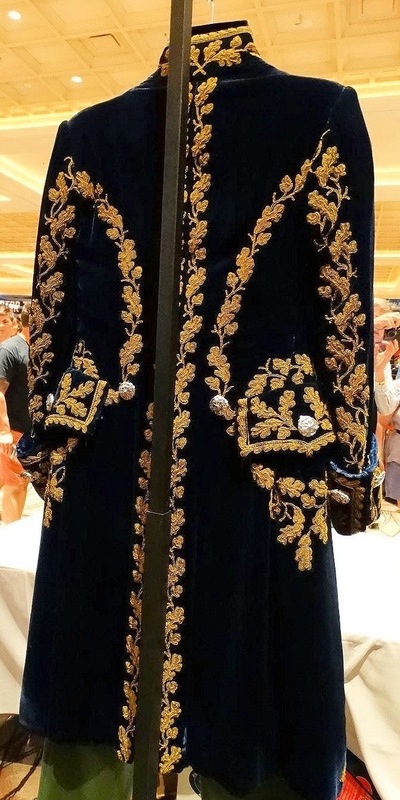 This is a costume study on the Cardassian Military Uniform featured heavily in Star Trek: Deep Space Nine. 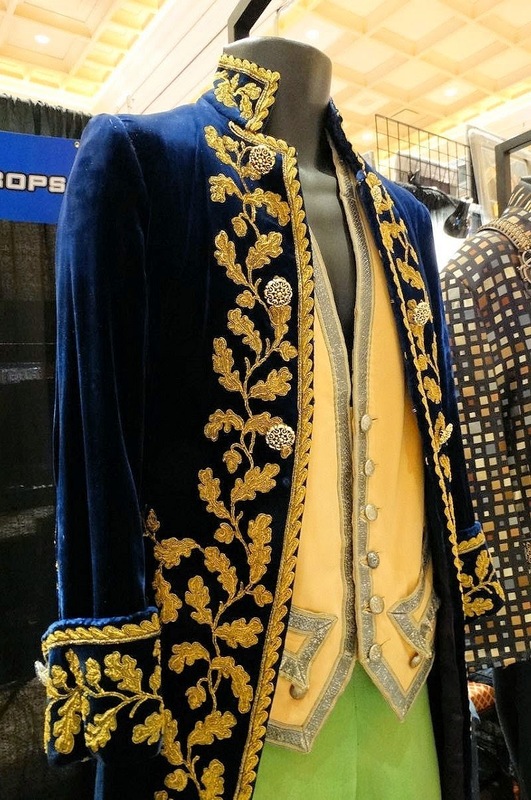 This incredibly beautiful uniform was purchased through the It’s A Wrap auctions in 2008 by my good friend and collector Alec Peters. 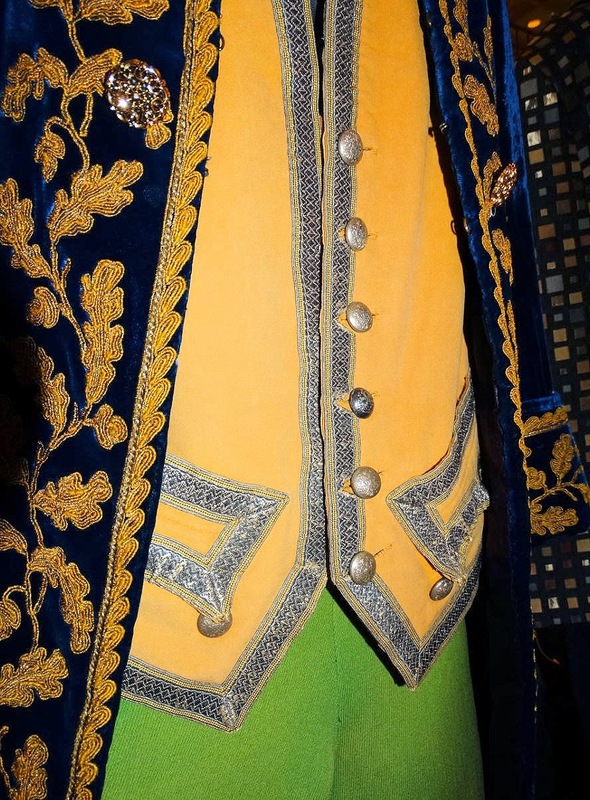 This specific uniform was worn by Garek (Andrew J. Robinson), one, if not the best characters that came from the series. 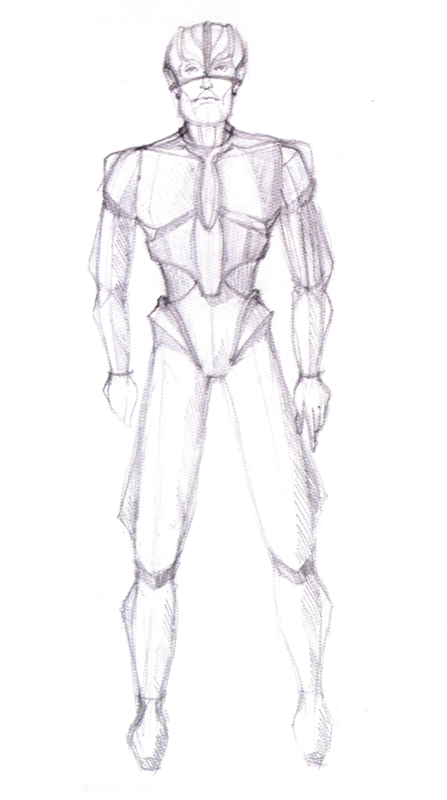 The uniforms are broken down into “types”, specifically type A, B, and C. Seen above in very early concept artwork for the Cardassians featured in TNG is the Type C uniform, a heavily padded uniform worn in the late 2360’s. This later changed to more noticeable Type B uniforms, which this Garek uniform is. 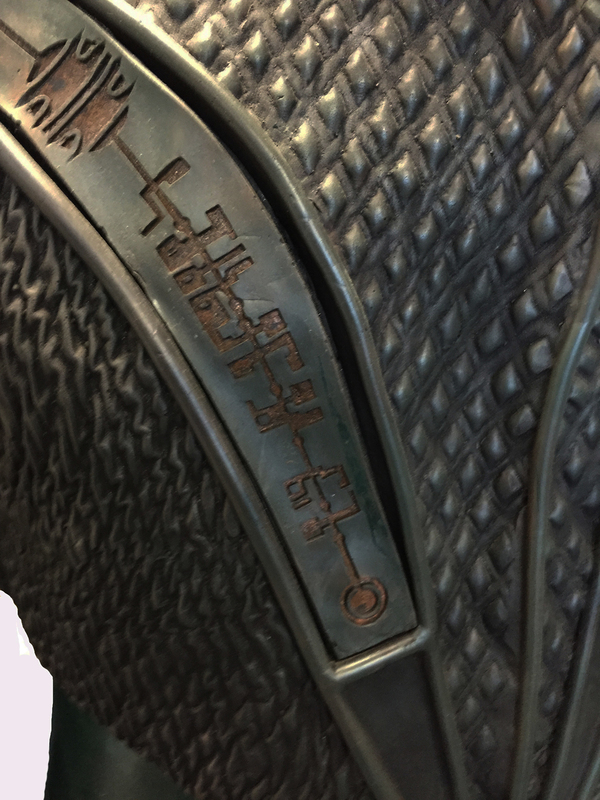 These were made by Robert Blackman, who made 12 for use in the DS9 pilot episode “Emissary”, and re-used 11 later in TNG. These uniforms feature a blue spandex and polyester under-suit, with long sewn in “ruffles” running on the sides down to the legs. 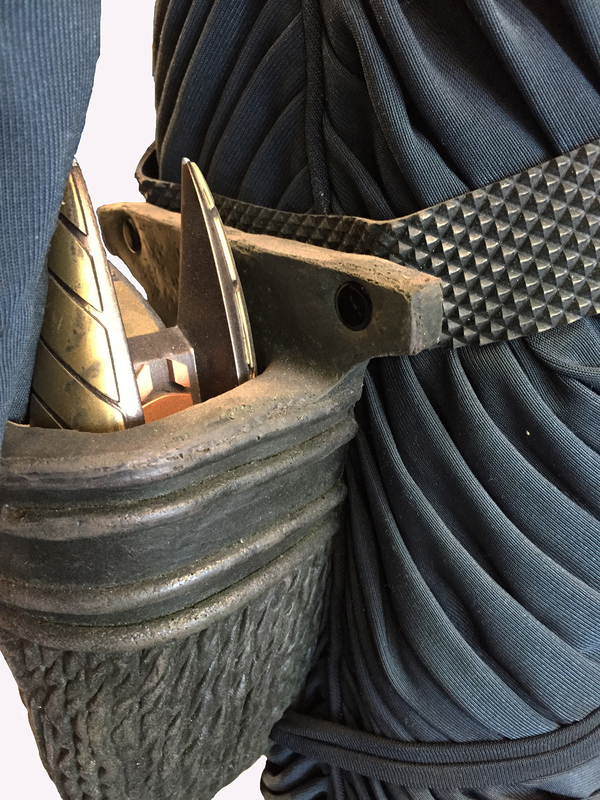 The chest piece is made of foam latex, the arm sections are cast separately and attached, the zippers are on the back running along the lines of the armor. 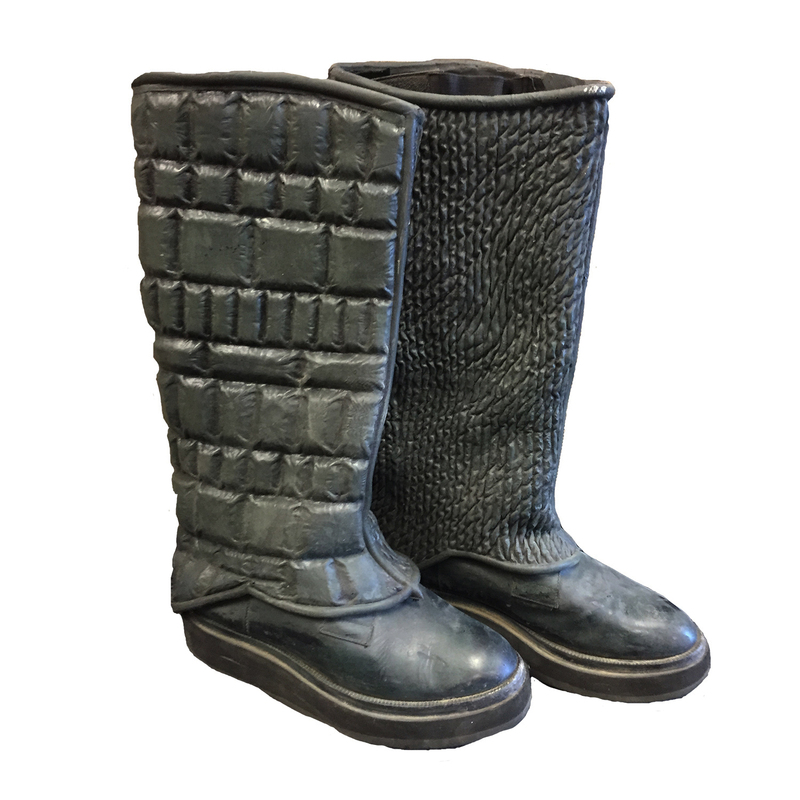 The uniform features green plates, two on each side of the abdomen and two on each elbow, it is completed by a pair of green boots, with added foam coverings with cast in detail. 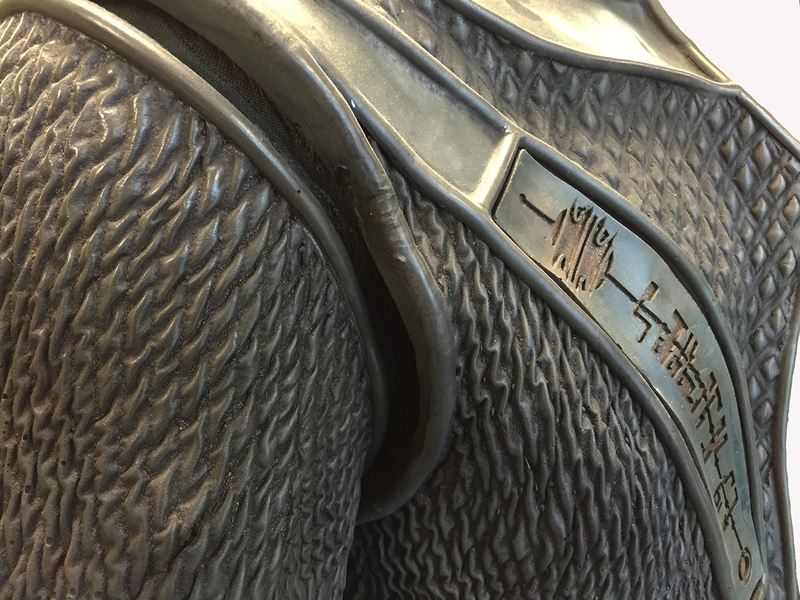 The chest-plate features an attached “Division Stripe”. 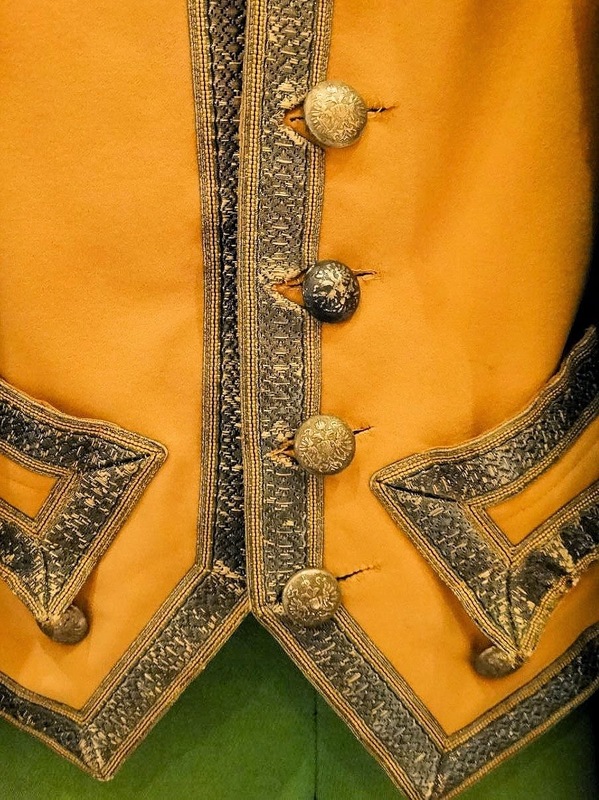 These were interchangeable on each uniform and are believed to feature rank, but the exact nature of what the stripe denotes is unknown. 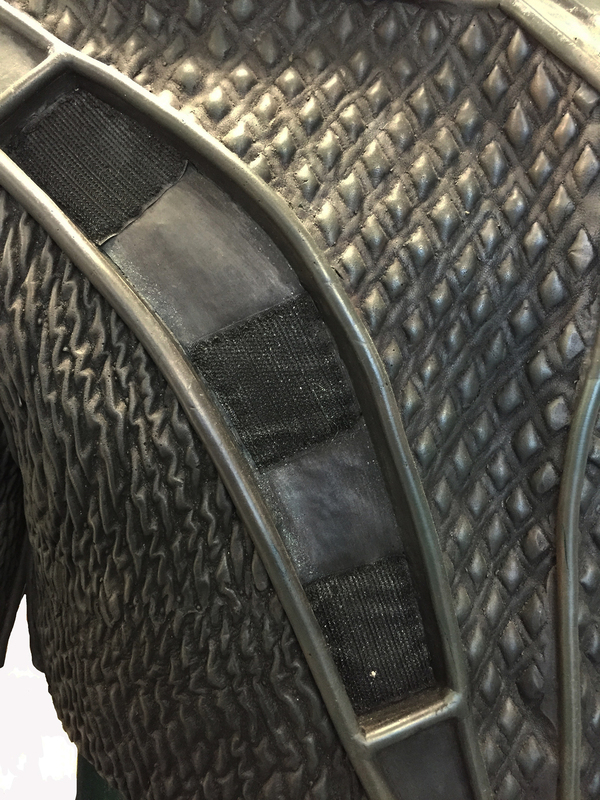 The stripe is also made of foam latex and attaches via three sections of Velcro. 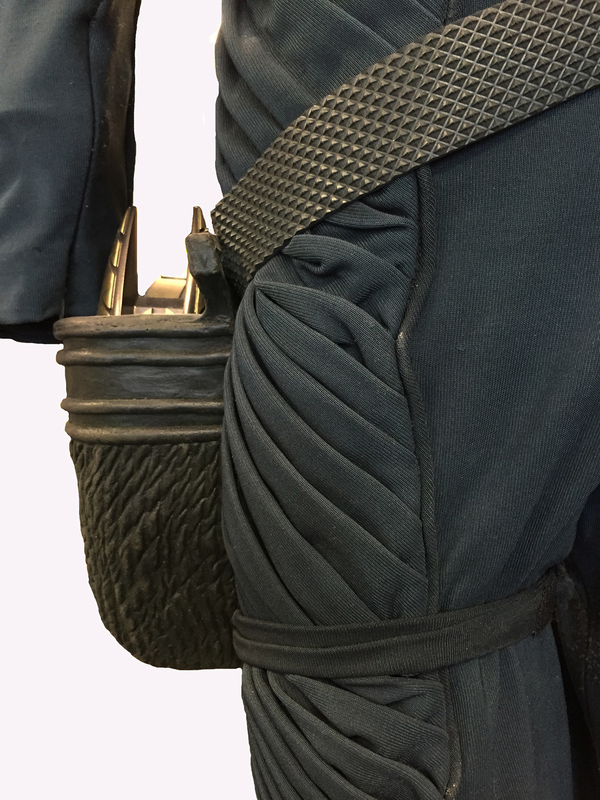 Another added feature is a dense foam holster, as seen below it is attached to the uniform via a belt and leg strap, and has been cast to fit the Cardassian phaser perfectly. 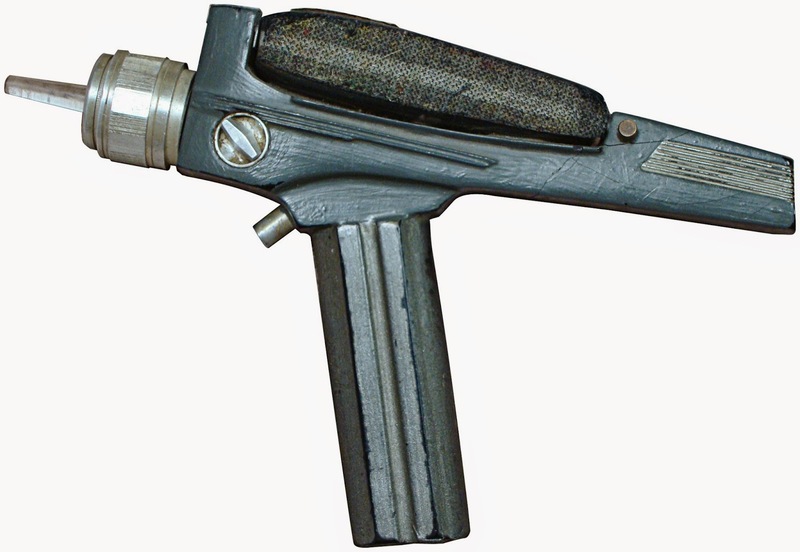 Note: Replica phaser pictured for display purposes. The Cardassian design in my mind is what truly sold the characters in Deep Space Nine. 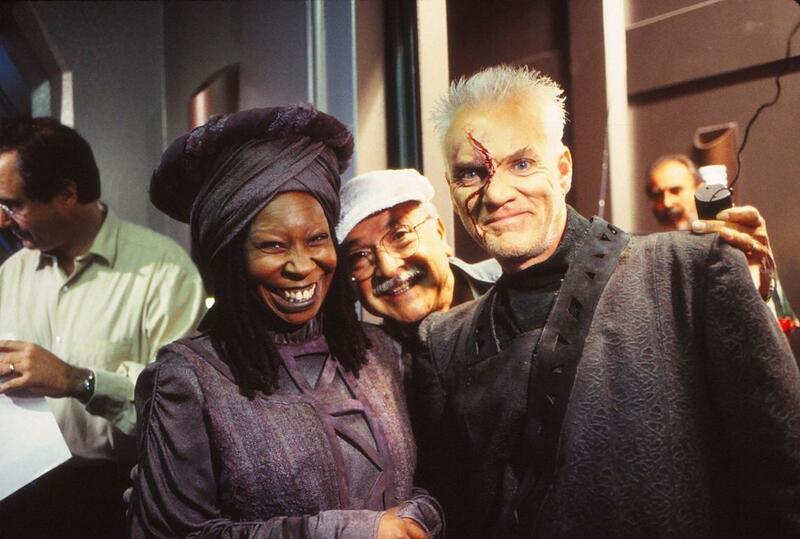 From the makeup, the costumes, to the architecture, the production went to great lengths to flesh out these aliens and make them special for the viewer. 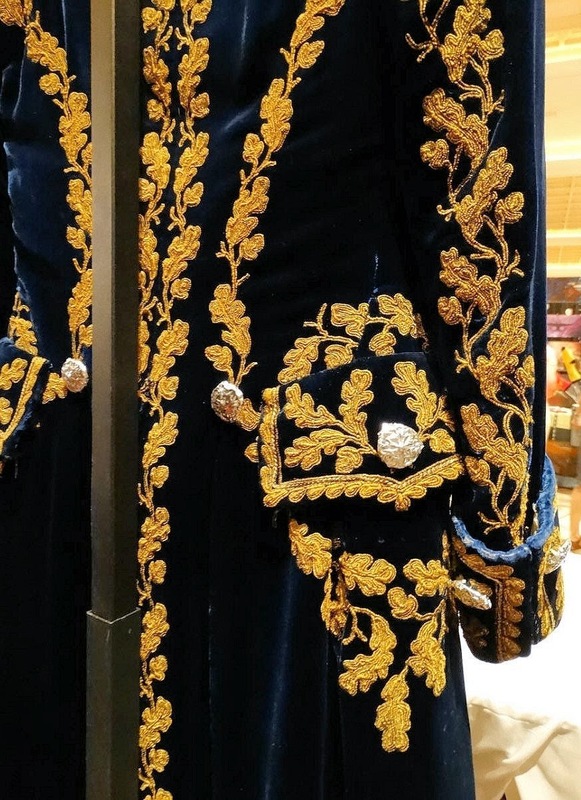 The military uniforms stand out as well crafted works of art, and went from a padded boxy rust-colored suits, to the beautiful, semi-medivial looking garb we saw in the finale of DS9. 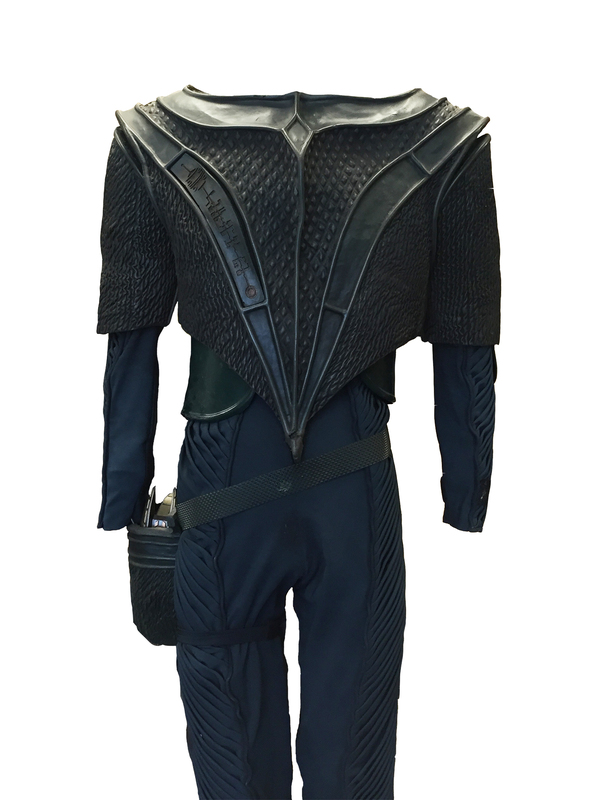 Check out Jarrod's new Star Trek prop & costume site Star Trek Artifacts. 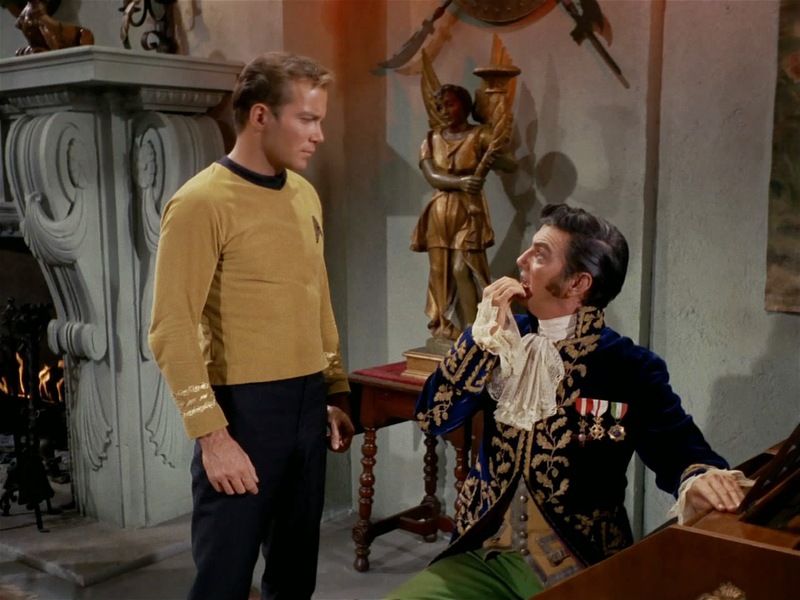 This costume was one of 2 known examples worn by actor William Campbell as Trelane in the 1st Season TOS episode "The Squire of Gothos" (original airdate: Jan. 12, 1967). 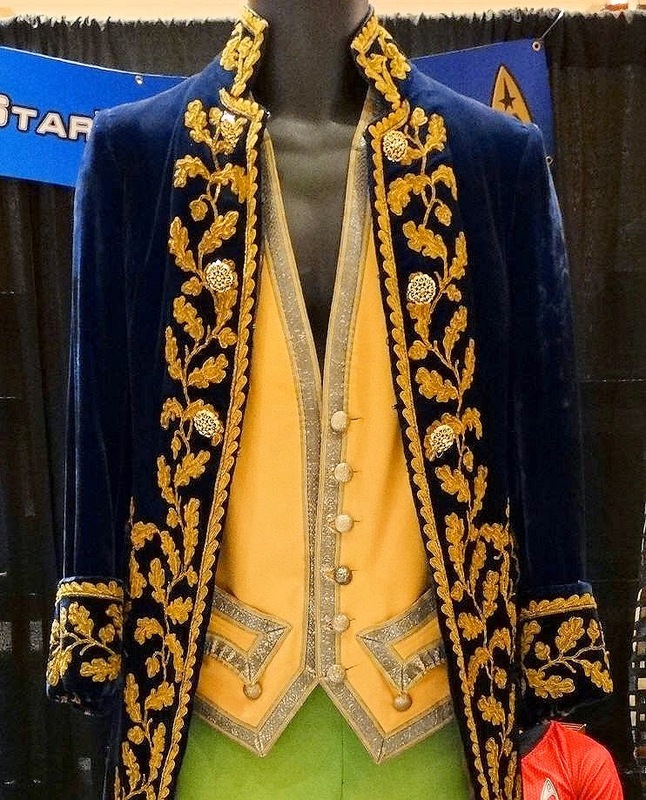 In 2013 I acquired two copies of this costume, giving one to the CBS Star Trek Archive. There is an unconfirmed rumor that there is a third copy that William Campbell himself owned. 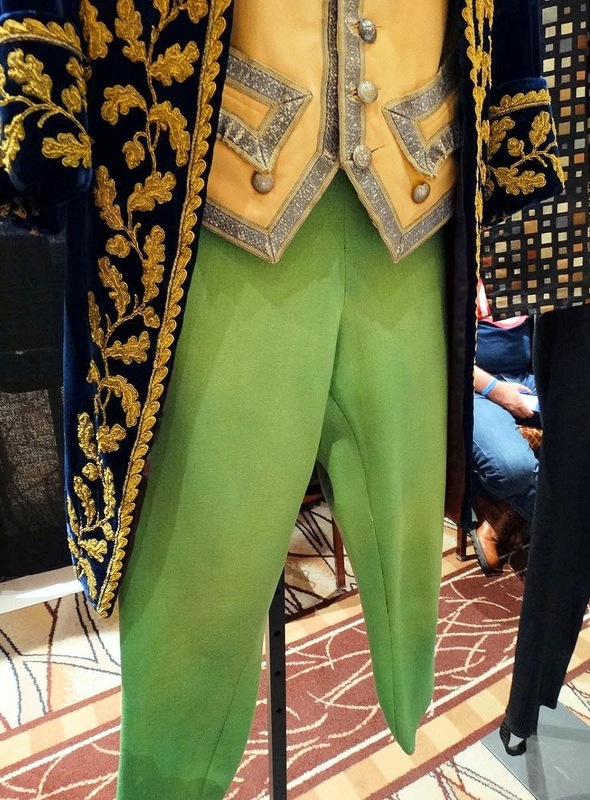 My good friend Gerald Gurian, took these photos last year when I displayed these costumes at the Creation Star Trek Las Vegas Convention. I am a firm believer in displaying my collection for all to see. Sharing my and other collections through this blog is part of the joy I get from collecting. Thanks to Gerald for the photos! 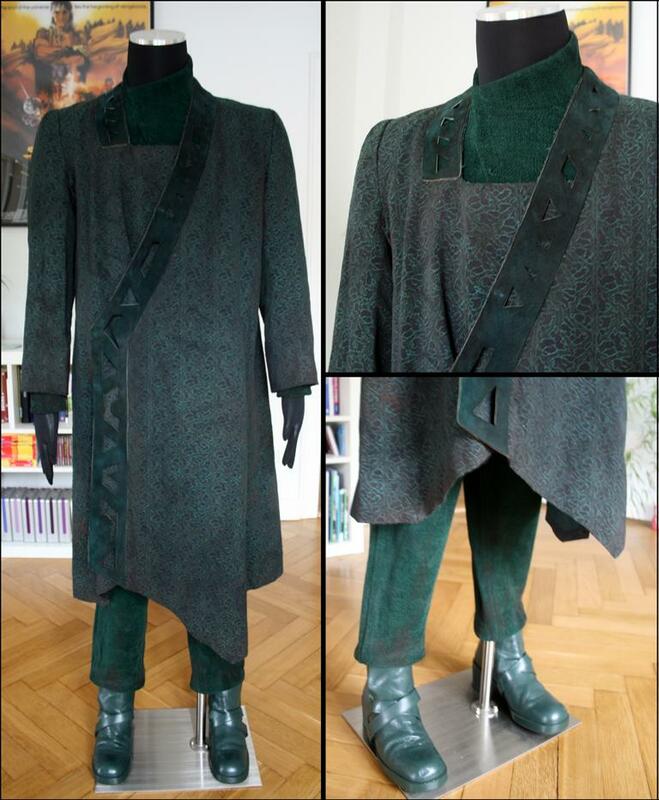 I'm proud to share pictures of Malcolm McDowell's El-Aurian costume from Star Trek: Generations. 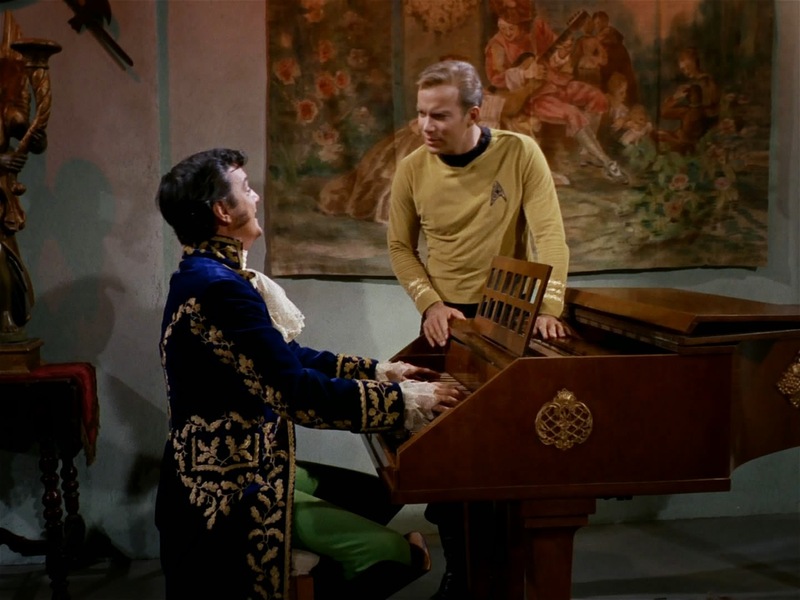 The costume was used during the opening scene of the movie when the Enterprise B is saving the refugees from the Nexus. 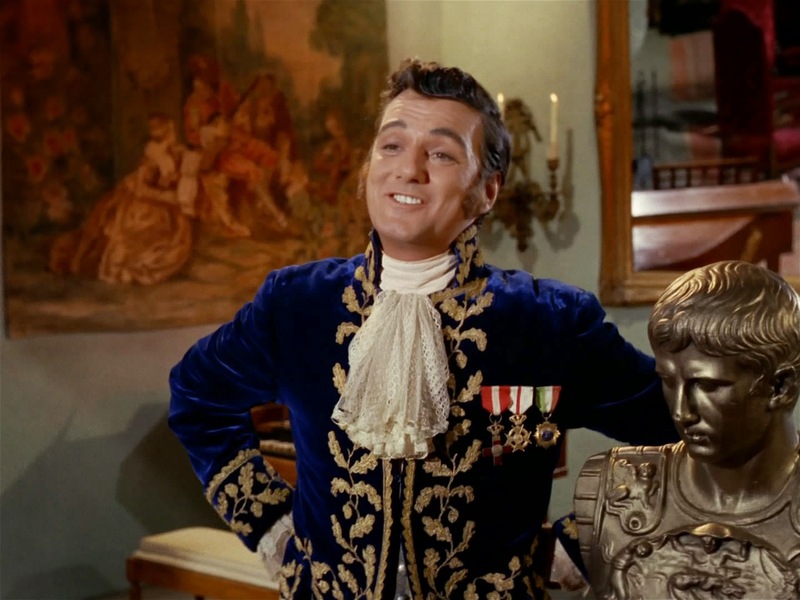 The costume is a complete hero with a long coat which is very heavy, a green shirt and trousers. It also has green painted shoes. 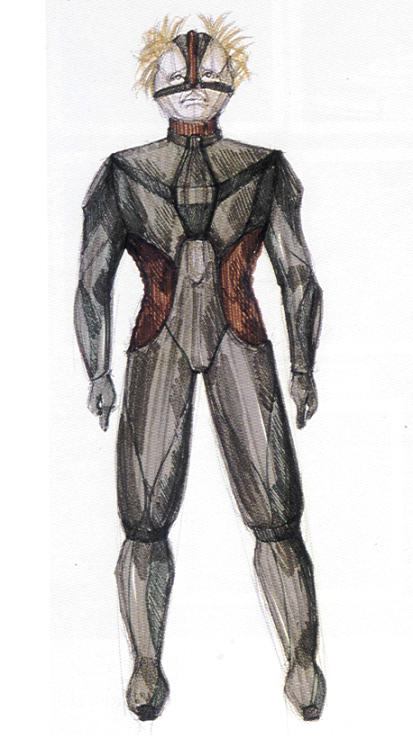 The costume is distressed and they made it to appear bloodied due to trauma occurring aboard the refugee ships. It's awesome.